Giovanni L.A. Natural Styling Gel is a highly rated hair gel on Amazon. It does have it's fair share of negative reviews as well. 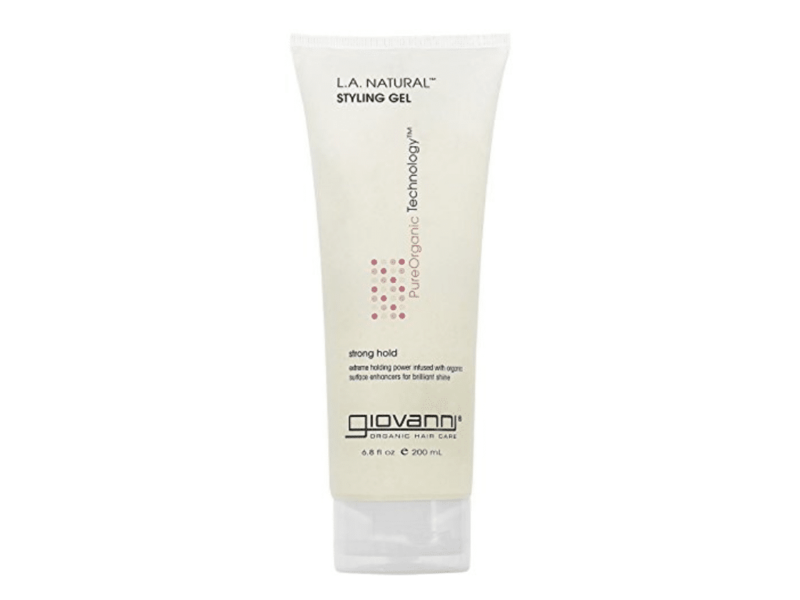 Giovanni L.A. Natural Styling Gel is a completely natural hair gel that is suppossed to be great for your hair. However, is this going to be the hair gel that works for you? There are a lot of factors to consider, so let's look at some of them in this review. By the end, hopefully you will know if this is the product for you. Giovanni L.A. Natural Styling Gel is an organic hair gel that is designed to moisturize your hair while also making it stylable. This is the type of hair gel I like to use, so instantly I am very interested. Hair gels that use only natural ingredients just make my hair feel better at the end of a long day. I'm also not afraid to throw a little in my beard too, which is something I would never do with a chemical based hair gel. The only downside that I could forsee with this product is the hold. A lot of the time when hair gels only use organic ingredients, they have to sacrifice on performance. Hair gel is something that you might not think about in terms of healthiness when you are buying a new tube. Admittedly, most people purchase hair gel based on effectiveness. What you might not know is that hair gel can be one of the most detrimental things you can do to your hair. It stays in your hair for a long time. It is in there possibly days. Only styling products stay in your hair that long. If they are full of damaging chemicals that can really wreck your hair. Luckily for us, Giovanni L.A. Natural Styling Gel is made of 100% organic ingredients. Not only are their ingredients organic, they are also good for your hair. This oil is the first ingredient listed behind filtered water on Giovanni L.A. Natural Styling Gel's list of ingredients. Rosemary has been proven to be great for your hair and scalp because of its hydrating properties. This can prevent your scalp from developing dandruff. It also helps stimulate the circulatory system. That will stimulate your hair follicles and help them get more of your body's nutrients. I was confused as to why they would just use the protein of a soybean initially. However, the protien strands can be configured in a way that can give Giovanni L.A. Natural Styling Gel the texture it needs to be a gel. Soybean Protein will be one of the main ingredients that helps style your hair. It combines with the other natural polymers in the hair gel to create something that will hold your hair fast and not leave it coated in an unnatural chemical. There are a ton of natural oils listed in Giovanni L.A. Natural Styling Gel's ingredient list. I've never seen that many oils listed on a hair gel. I looked them up, and all of the ingredients are supposed to help nourish your hair and scalp. There are so many oils moisturizing and revitalizing your scalp in this hair gel it almost seems like a leave-in natural conditioner. Giovanni L.A. Natural Styling Gel has 4.3 stars on Amazon. That is pretty good. I feel like people are always generous on Amazon. However, I think some of the negative reviews are coming in because of the performance of this hair gel. Complaints range from not liking how wet it makes their hair initially to how the gel holds up. If your hair gets too wet from your hair gel upon application, doesn't that just mean you used too much? However, I understand being sad when your hair gel doesn't hold up well. Giovanni L.A. Natural Styling Gel is all natural though, so by nature it won't hold up as well as some of the glycerin based products available. On the other hand, many consumers think this product holds their hair just fine. Depending on your hair and climate, you may have different hair gel needs. Giovanni Cosmetics is a company that is focused on bringing salon quality products that are all natural to the mainstream market. Every one of their products is as pure and natural as they can make it without sacrificing the performance of the product. None of their products contain Formaldahyde, Propyline Glycol, or animal byproducts. All of their products are also biodegradable and packaged in eco-friendly packaging.Most of their products are also vegan. There are just a few that contain lactoferrin or honey. Giovanni L.A. Natural Styling Gel is all natural. That means less hair damage and coating over time. This hair gel also has many great ingredients for your hair. It should leave your hair feeling more soft and smooth. The company is also doing its best to take care of the enviornment. This product may not perform at the level you would like. Your hair may need a more rigid hair gel that natural gels can not provide. There also isn't really an available option for a large amount of this product. You can only order the 6.8 oz tube. It is kind of expensive at almost a dollar an ounce. Giovanni L.A. Natural Styling Gel is a great product that you will probably like. If you are environmentally aware and you want your hair to stay healthy, this is a great hair gel for you. Some reviews are negative on the hold, but that is often variable. How you use your hair gel is also a factor. If you are just taming your hair, there is no excuse not to go natural. If you are styling it, often how much you apply or how much time you have are some factors to consider. Giovanni L.A. Natural Styling Gel is worth giving a shot if you want to take care of your hair. Give it a try today, and you might find that you have found your new hair gel. Here are some top questions that I found for people seriously considering buying the Giovanni L.A. Natural Styling Gel. How many ounces is it?You can only buy it in a 6.8 oz tube as far as I know.